Lot 386. A richly-jewelled two-coloured gold snuff box, Johann Wilhelm Keibel, St. Petersburg, 1845; 9.2cm., 3 5/8 in. wide. Estimate 20,000 — 30,000 GBP. 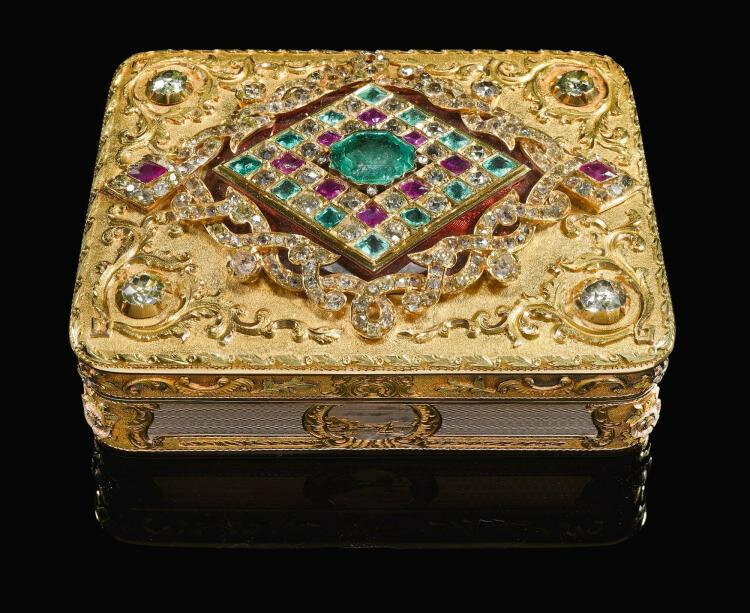 Courtesy Sotheby's 2018.
rectangular with rounded corners, the lid applied with an emerald, diamond and ruby-set lozenge centred by an octagonal step-cut emerald and framed by diamond-set scrolls mounted in yellow gold over red enamel on a wavy engine-turned ground, a diamond at each corner, chased with scrollwork on a sablé ground, two sides and the base engraved with scroll-framed medallions of riverscapes and architectural scenery on reeding, the corners and base chased with flower motifs in relief, maker's name, workmaster's mark B.K, assay master Dmitriì Ilbich Tverskoì (1834-1851), city mark, further struck: 56 (for 14 ct gold), numbered: 3082, 161, 934, later French import marks. Note: The jeweller and goldsmith Otto Samuel Keibel, born in Pasewalck in Prussia in 1768, founded his own workshop in St. Petersburg in 1797 and is perhaps best known for his close links to the Russian court who commissioned him for a number of exceptional presentation boxes. When he died in 1809, shortly after having become an alderman in 1807-1808, his son Johann Wilhelm Keibel continued the business, using the same signature as his father and creating gold boxes, objets d’art and insignia of the same quality, as demonstrated in 1826 when he reworked the Imperial Crown for the coronation of Tsar Nicholas I, future Emperor of Russia. Having received the Imperial Warrant, Keibel’s firm was in charge of the production of all insignia for orders from 1836 until 1841. 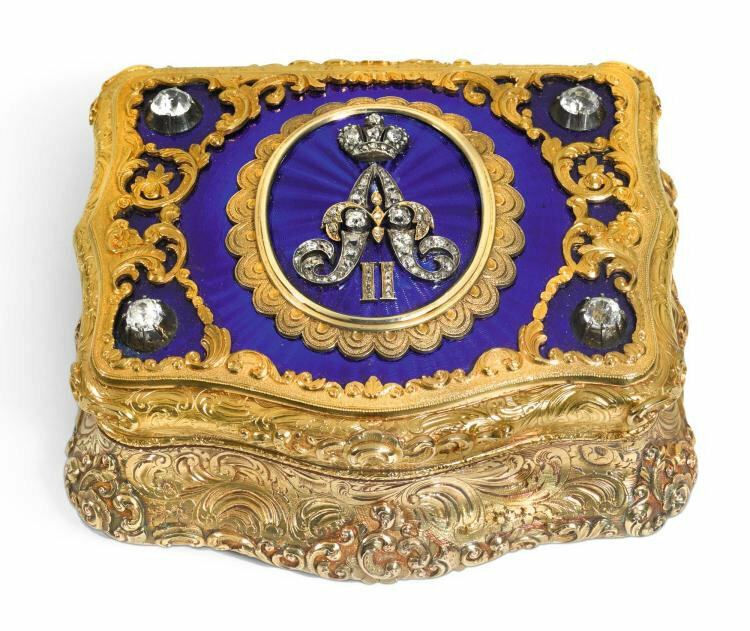 His close relationship with the Russian Imperial family also manifested itself in the creation of jewelled gold boxes which members of the family gave away as mementos. 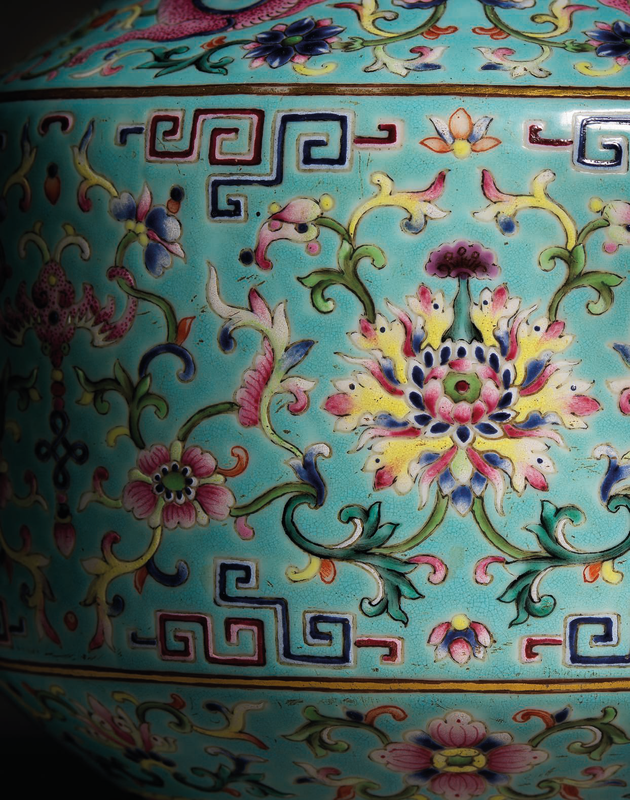 Examples can be found in most important private and museum collections such as the Hermitage, the Victoria & Albert Museum and the Metropolitan Museum of Art.